KUTUPALONG REFUGEE CAMP, Bangladesh -- Rehana Khatun dreamed her husband came home. He appeared without warning in their village in western Myanmar, outside their handsome wooden house shaded by mango trees. “He didn’t say anything,” she said. “He was only there for a few seconds, and then he was gone.” Then Rehana Khatun woke up. Rehana Khatun’s handsome wooden house is gone, too. So is everything in it. The Rohingya homes in Inn Din were burned to the ground, and what was once a close-knit community, with generations of history in Myanmar, is now scattered across the world’s largest refugee camp in Bangladesh. A Reuters investigation in February revealed what happened to the 10 Rohingya men. On September 1, soldiers snatched them from a large group of Rohingya villagers detained by a beach near Inn Din. The next morning, according to eyewitnesses, the men were shot by the soldiers or hacked to death by their Rakhine Buddhist neighbors. Their bodies were dumped in a shallow grave. The relatives the 10 men left behind that afternoon wouldn’t learn of the killings for many months - in some cases, not until Reuters reporters tracked them down in the refugee camps and told them what had happened. The survivors waited by the beach with rising anxiety and dread as the sun set and the men didn’t return. This is their story. Three of them fled Inn Din while heavily pregnant. All trekked north in monsoon rain through forests and fields. Drenched and terrified, they dodged military patrols and saw villages abandoned or burning. Some saw dead bodies. They walked for days with little food or water. They were not alone. Inn Din’s families joined nearly 700,000 Rohingya escaping a crackdown by the Myanmar military, launched after attacks by Rohingya militants on August 25. The United Nations called it “a textbook example of ethnic cleansing,” which Myanmar has denied. On Tuesday, the military said it had sentenced seven soldiers to long prison terms for their role in the Inn Din massacre. Myanmar government spokesman Zaw Htay told Reuters the move was a “very positive step” that showed the military “won’t give impunity for those who have violated the rules of engagement.” Myanmar, he said, doesn’t allow systematic human rights abuses. Reuters was able to corroborate many but not all details of the personal accounts in this story. 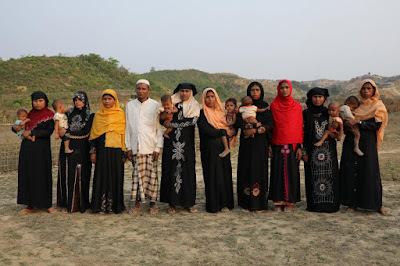 The Rohingya streamed north until they reached the banks of the Naf River. On its far shore lay Bangladesh, and safety. Many Inn Din women gave boatmen their jewelry to pay for the crossing; others begged and fought their way on board. They made the perilous crossing at night, vomiting with sickness and fear. Now in Bangladesh, they struggle to piece together their lives without husbands, fathers, brothers and sons. Seven months have passed since the massacre, but the grief of Inn Din’s survivors remains raw. One mother told Reuters her story, then fainted. Like Rehana Khatun, they all say they dream constantly about the dead. Some dreams are bittersweet - a husband coming home, a son praying in the mosque - and some are nightmares. One woman says she sees her husband clutching a stomach wound, blood oozing through his fingers. Daytime brings little relief. They all remember, with tormenting clarity, the day the soldiers took their men away. Abdul Amin still wonders why he was spared. Soldiers had arrived at Inn Din on August 27 and started torching the houses of Rohingya residents with the help of police and Rakhine villagers. Amin, 19, said he and his family sought refuge in a nearby forest with more than a hundred other Rohingya. Four days later, as Inn Din burned and the sound of gunfire crackled through the trees, they made a dash for the beach, where hundreds of villagers gathered in the hope of escaping the military crackdown. Then the soldiers appeared, said Amin, and ordered them to squat with their heads down. The soldiers, according to Amin and other witnesses, said they were taking the men away for a “meeting.” Their distraught families waited by the beach in vain. As night fell, they returned to the forest where, in the coming days, they made the decision that haunts many of them still: to save themselves and their families by fleeing to Bangladesh - and leaving the captive men behind. Abdu Shakur waited five days for the soldiers to release his son Rashid Ahmed, 18. By then, most Rohingya had set out for Bangladesh and the forest felt lonely and exposed. Abdu Shakur said he wanted to leave, too, but his wife, Subiya Hatu, refused. “I won’t go without my son,” she said. “You must come with me,” he said. “If we stay here, they’ll kill us all.” They had three younger children to bring to safety, he told her. Rashid was their oldest, a bright boy who loved to study; he would surely be released soon and follow them. He didn’t. Rashid was one of the 10 killed in the Inn Din massacre. “We did the right thing,” says Abdu Shakur today, in a shack in the Kutupalong camp. “I feel terrible, but we had to leave that place.” As he spoke, his wife sat behind him and sobbed into her headscarf. By now, the northward exodus was gathering pace. The Rohingya walked in large groups, sometimes thousands strong, stretching in ragged columns along the wild Rakhine coastline. At night, the men stood guard while women and children rested beneath scraps of tarpaulin. Rain often made sleep impossible. Amid this desperate throng was Shaker Ahmed’s wife, Rahama Khatun, who was seven months pregnant, and their eight children, aged one to 18. 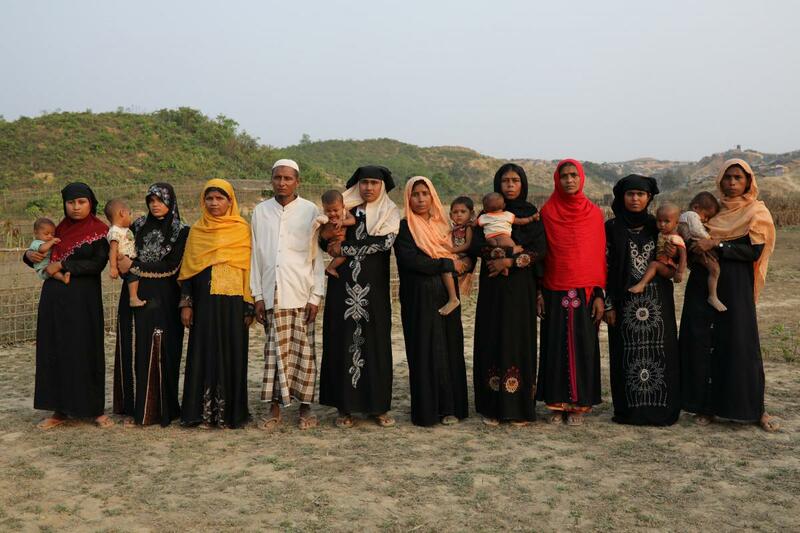 Like many Rohingya, they had escaped Inn Din with little more than the clothes they wore. “We brought nothing from the house, not even a single plate,” she said. They survived the journey by drinking from streams and scrounging food from other refugees. Rahama said she heaved herself along slippery paths as quickly as she could. She was scared about the health of her unborn child, but terrified of getting left behind. Rahama’s legs swelled up so much that she couldn’t walk. “My children carried me on their shoulders. They said, ‘We’ve lost our father. We don’t want to lose you.’” Then they reached the beach at Na Khaung To, and a new ordeal began. Na Khaung To sits on the Myanmar side of the Naf River. Bangladesh is about 6 km (4 miles) away. For Rohingya from Inn Din and other coastal villages, Na Khaung To was the main crossing point. It was also a bottleneck. There were many Bangladeshi fishing boats to smuggle Rohingya across the river, but getting on board depended on the money or valuables the refugees could muster and the mercy of the boatmen. Some were stranded at Na Khaung To for weeks. Bangladesh was perhaps a two-hour ride across calm estuarine waters. But the boatmen wanted to avoid any Bangladesh navy or border guard vessels that might be patrolling the river. So they set off at night, taking a more circuitous route through open ocean. Most boats were overloaded. Some sank in the choppy water, drowning dozens of people. The boatmen charged about 8,000 taka (about $100) per person. Some women paid with their earrings and nose-rings. Others, like Abdu Shakur, promised to reimburse the boatman upon reaching Bangladesh with money borrowed from relatives there. He and his wife, Subiya Hatu, who had argued over leaving their oldest son behind at Inn Din, set sail for Bangladesh. Another boat of refugees sailed along nearby. Both vessels were heaving with passengers, many of them children. Abdu Shakur and his family made it safely to Bangladesh. So did the other families bereaved by the Inn Din massacre. During the crossing, some realized they would never see their men again, or Myanmar. Two months later, in a city-sized refugee camp in Bangladesh, Shuna Khatu gave birth to a boy. She called him Mohammed Sadek. Rahama Khatun, who fled Myanmar on the shoulders of her older children while seven months pregnant, also had a son. His name is Sadikur Rahman. The two women were close neighbors in Inn Din. They now live about a mile apart in Kutupalong-Balukhali, a so-called “mega-camp” of about 600,000 souls. Both survive on twice-a-month rations of rice, lentils and cooking oil. They live in flimsy, mud-floored shacks of bamboo and plastic that the coming monsoon could blow or wash away. It was here, as the families struggled to rebuild their lives, that they learned their men were dead. Some heard the news from Reuters reporters who had tracked them down. Others saw the Reuters investigation of the Inn Din massacre or the photos that accompanied it. Two of those photos showed the men kneeling with their hands behind their backs or necks. A third showed the men’s bodies in a mass grave. The photos were obtained by Reuters reporters Wa Lone and Kyaw Soe Oo, who were arrested in December while investigating the Inn Din massacre. The two face charges, and potentially 14-year jail sentences, under Myanmar’s Official Secrets Act. Rahama Khatun cropped her husband’s image from one of the photos and laminated it. This image of him kneeling before his captors is the only one she has. Every other family photo was burned along with their home at Inn Din.